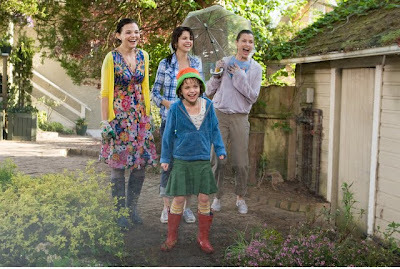 Even though the film's title brings to mind former librarian turned author Beverly Cleary's novel Beezus and Ramona , screenwriters Lori Craig and Nick Pustay ignored that work completely and instead pulled plot points from Ramona Forever , Ramona and Her Father , Ramona and Her Mother , Ramona's World and Ramona Quimby, Age 8 . And even though the work struggles with the contradiction of perhaps too little going on in terms of the overall plot while at the same time being bogged down by subplots that cull memorable incidents from throughout Cleary's series, overall like its young heroine who often gets in trouble when her ambitious plans turn to chaos, you just can't help but find yourself smiling warmly because Ramona 's heart is in the right place. Blu-ray Features: Fox continues to rival Disney with the phenomenal technical quality of their budget-minded Combo Packs that contain the movie in three different formats -- Blu-ray, DVD as well as Digital Copy to help ensure that you'll never have to buy the film in another version. Sterling picture quality and a spirited soundtrack impress in high definition in this polished transfer of the theatrical release a few months ago. And while the requisite deleted scenes and gag reel aren't worth your time, in addition to a nice but exceptionally brief chat with author Cleary, there are two outstanding creative-minded extras featuring director Elizabeth Allen. In the first featurette, she presents a "Show & Tell Film School" along with star Joey King to encourage, educate and inspire kids with some filmmaking basics before complimenting this bonus video with another great Fox Movie Channel: Life After Film School installment aimed at those about to embark on their own careers in the industry.